This perfectly located, newly constructed, 2200 square foot town home features 2 master suites, as well as two additional bedrooms, one of which includes a large, 12'x14' sitting area with a queen size foldout couch. In total, the property can comfortably sleep 10 guests. There is also a 2-car garage, in-unit laundry, stainless steel appliances, a wine fridge, and a large deck off of the living room and dining room. The Stowe Shuttle passes right in front of the entrance to the condo complex, so you can hitch a free ride to the mountain or into town every half hour when the shuttle goes past. It is also just across the street from the Stowe Rec Path for jogging, cycling, or cross country skiing. There is even a Tesla charging station in the garage available to those traveling in an electric vehicle. The location and amenities can't be beat! 2 garage spaces. Tesla charging station available for tenant use in the garage. Just 3 miles to the Northeast's premier ski mountain. No equipment is provided to guests. We stayed at this house with our two kids and another family of 4. The house is very nice inside and out. The setup was perfect for us! The location could not be better with easy access to the mountain and town. Would love to stay here again! This house is the perfect home base while skiing or otherwise exploring Stowe. Located between town and the ski hill, and only a short drive to each, it is perfectly convenient. It is also modern, sparkling clean, cozy, and comfortable in every respect. It is fully equipped - with cooking implements, linens and extra bedding, shampoo and soap in the showers - so it is easy to feel right at home as soon as you arrive. It is spacious, and accommodated our family of five with room to spare. Dan (owner) is incredibly responsive and accommodating, and the whole rental experience could not be easier. We have stayed at this house twice so far, and already have our next stay planned. Can't wait to return. Great place and totally recommend! Such a great place! Location is perfect but even better is the condition of the house! Clean and has everything you could possibly want...we so enjoyed our stay here and will definitely be back! Beautiful home with everything you'd ever need! Went for a ski weekend with my grown children! The house is meticulous and so comfortable for a group of 8 or 10. It is stocked with everything you'll ever need. The location is perfect when skiing at Stowe, 5 miles up to the mountain, restaurants galore on the access road. Dan, the owner, couldn't be nicer! You will love it!! Very nice, clean townhome, perfect for the 7 of us. Only 5 min drive to the mtn. Owner is extremely accomodating. The house is wonderful! Tastefully decorated, immaculate, very well stocked and centrally located. We will definitely come again! 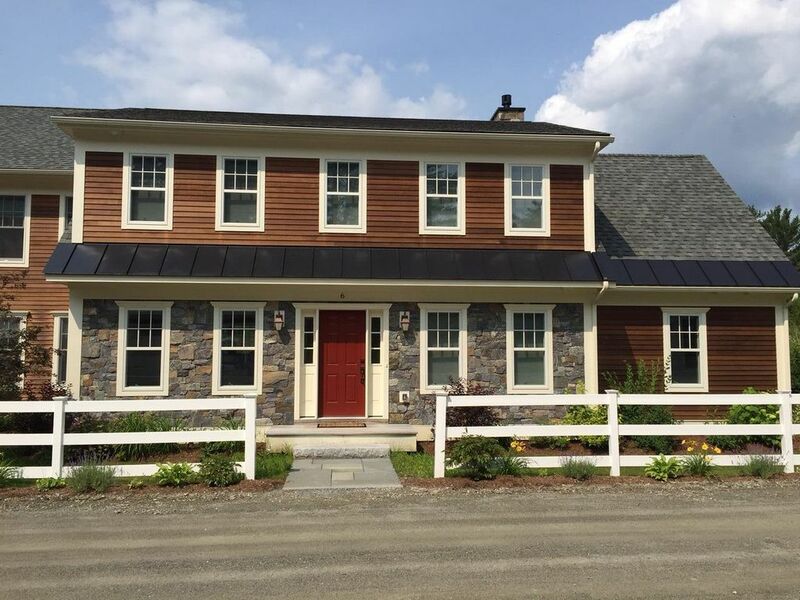 Located 3.5 miles from Stowe mountain on Mountain Road close to shops, restaurants and the Stowe Rec Path, great for cycling, running and cross country skiing.